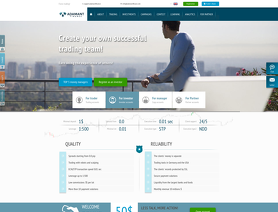 AdamantFinance is a forex broker. Adamant Finance offers the MT4 and MT Mobile forex trading top platform. AdamantFinance.com offers over 25 forex currency pairs, gold and silver for your personal investment and trading options. For our clients, we offer 3 types of accounts, the minimum amount of replenishment is 1 USD / EUR, maximum leverage is 1: 500. Adamant finance still work and catching money from new victims. but for traders who sent money - MT4 platform dont work. When we ask about it. adamant Support answearing about it "Dear Customer! Our experts are engaged in this issue. As soon as they are finished, we will send you an email. If in the result of these problems you incur any losses, the company Adamant Finance compensates them. But its not true, Why adamant dont write about this problem on his web page. ? And it not possible to withdrawl money.But after try to do it you can see message. Try to make a payment again! In case of repeated error, please contact the technical support department of a convenient way for you! Jan 5, 2018 - 1 Star I have filed a withdrawal on December 28, 2017, but until now the process is still Pending. I have sent emails to the support section several times but until now there has not been any replies. I try to connect customer service, but only promised 1x24 hours. In fact until now there is no response at all from the Adamant Finance. Is this the service now from Adamant Finance? Honestly, I am very disappointed. Can anyone help me? Good customer service that answered my questions and helped with issues opening and funding a new account. Adaman Finance daily improves the conditions for its customers.